Dozens of Syrians head towards Israeli side of Golan Heights, close to within 200 yards of the border to request entry. Syrian refugees moved in towards the Israeli frontier Tuesday afternoon, requesting they be allowed to cross the border into Israel. 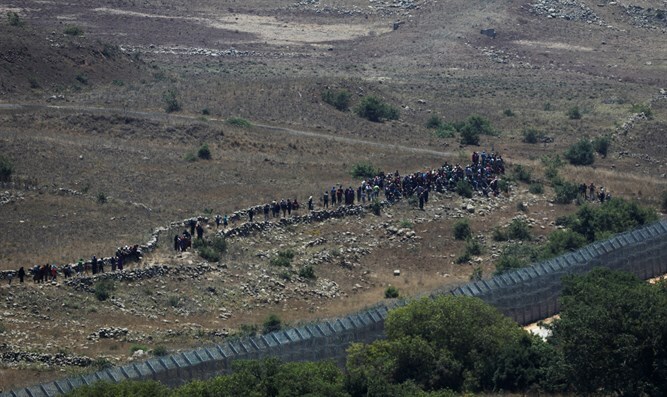 Dozens of Syrians were spotted approaching the Israeli border on the Golan Heights, converging on the border fence from the Kuneitra area, on the Syrian side of the Golan. The Syrians waved white makeshift flags and requested they be permitted to enter Israel. Israeli security forces stationed along the border ordered them to halt, stopping the group of Syrians roughly 200 yards from the border checkpoint. IDF soldiers on the border then ordered the Syrians to move away from the Israeli border. The refugees requested asylum in Israel, but were promised aid by the Israeli soldiers if they moved back from the border fence. “We want asylum in Israel,” refugees reportedly told the soldiers at the border. "You are on the border of the State of Israel. Go back, we don't want to hurt you," soldiers said, according to Reuters. Last month, tens of thousands of Syrian refugees were spotted heading towards the Golan Heights, fleeing violence in the southern Syrian Daraa region amid a new campaign by Assad’s forces to crush rebel forces in the area. Israeli officials reiterated that Israel would not permit Syrians to enter the country, though Israel would continue its policy of providing humanitarian aid to refugees and medical treatment to injured Syrian civilians. In late June, Israel transferred large quantities of humanitarian aid to Syrian refugees living in camps along the border, including 13 tons of food stuffs, 15 tons of baby, hundreds of tents, and 30 tons of clothing and footwear.